With 25 years of marketplace experience, Castles Technology has established itself as a top global manufacturer of next-generation card acceptance hardware. Our goal is to create simple, smart and secure payment solutions that provide mobility and flexibility for a diverse range of SMBs in attended and unattended payment environments such as retail, vending, micro markets, restaurants, transportation, finance, lodging and hospitality. At Castles, we are out to prove that we are a reliable partner who can help businesses maximize their profits with our future-proof point-of-sale devices and best-in-class support offerings. We pride ourselves on crafting payment solutions that are ergonomic, remove burdensome costs and integrates with any SMB's existing POS operation. US headquarters are in Atlanta, Ga. Global headquarters are in Taipei, Taiwan. Castles has 11 regional offices across Asia, Europe, North and South America. SUZOHAPP is a technology company providing software and hardware for cash handling automation and self-service solutions to more than 25,000 customers throughout the world. SUZOHAPP's technology enables automation for customers operating in a variety of end markets, including retail, transportation, gaming, banking, vending and amusement. SUZOHAPP's solutions include cash deposit, recycling, processing and payment systems as well as a broad range of self-service component technologies. 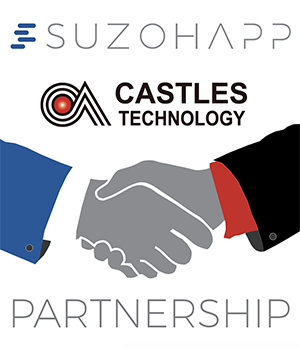 The brands of SCAN COIN, Comestero, CashCompleteTM and Coinco are united under the SUZOHAPP Company. SUZOHAPP's more than 1,100 employees operate in 19 countries and its dealer network covers more than 100 countries. More information is available at http://www.suzohapp.com. SUZOHAPP is owned by affiliates of ACON Investments, L.L.C., a Washington, D.C.- based international private equity investment firm that has responsibility for managing approximately $5.5 billion of capital. For more information, visit http://www.aconinvestments.com.